Every time I see new photos from NASA I feel so tiny , and so amazed by the beauty of the Universe.It's silent, mysterious and so abstract with all the merging colors on a deep black background. It is truly a great source of inspiration and a very cool theme to use on your products or clothing. 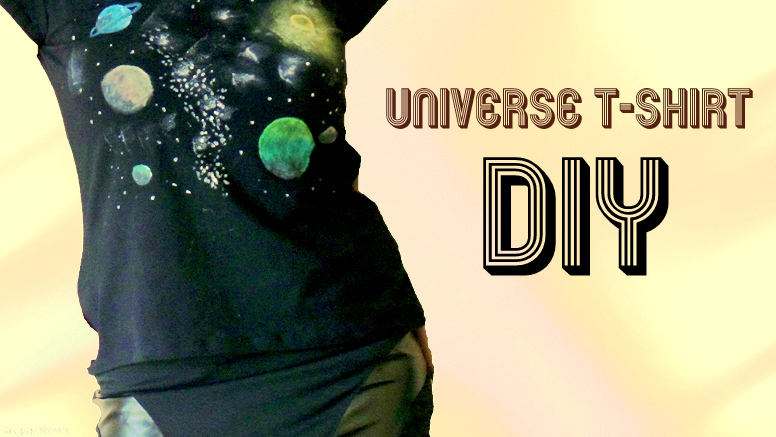 There is a trend circulating lately , with Galaxy DIYs, where it shows you how to obtain those abstract patterns and colors of galaxies, so I thought I would show you a more complex design with a piece of the Universe, that includes planets, stars and galaxies. So to make this very useful for you , I thought of a T-shirt with Universe design, because clothing with designs like that can be very very expensive. You will also need a paint brush and some water. 1. 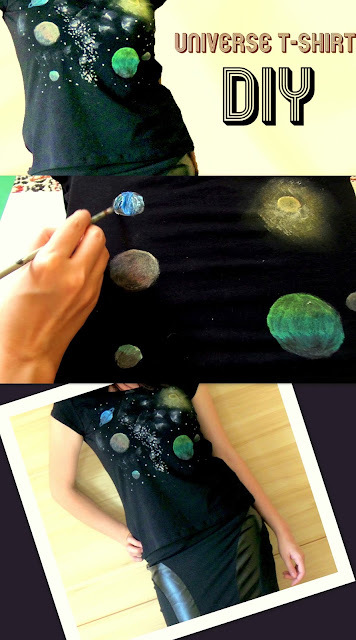 Since the T-shirt is black , don't paint colorful planets directly because they will not stand out. First paint some white circles and use color on top of that. 2.Choose one of the circles to be a source of light -like a sun or a star-and paint the circle with a very light light yellow/orange. After that don't draw lines around it like in preschool.Use the sponge and tap around it. Use one layer of the same light color, one layer of white and again a layer of light color- but one on top of the other and not one next to each other. 3.If you have your source of light, imagine that it spreads light on the surrounding planets as well- so the light will touch the other planets perpendicular. 4. To illustrate that , paint the planets in blending shades of color. -Mix green with blue and paint an other layer bellow the the anterior one.